Slope to Success (or World 4-2) is the second level of World 4 and the fourteenth level overall in Super Mario Run. The level starts out with a slope with many Goombas. Upon reaching a ? 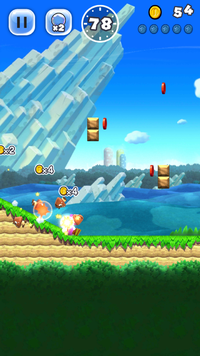 Block with a Super Mushroom, the first Pink Coin is immediately after, and can be collected by just a single jump. After jumping on a trampoline, a Red Ring appears, followed by a few trampolines and the second Pink Coin enclosed by Brick Blocks. Immediately after, the player must wall jump between two warp pipes and slide down the top portion to get the third Pink Coin. Immediately afterwards, the player must bounce on a trampoline to smash through some Brick Blocks and get the fourth Pink Coin. After another slide the player will fire out of a cannon, then slide down to the fifth and final Pink Coin. After another trampoline and just a few more slides, the player will reach the Goal Pole. The level starts out with a slope with many Goombas. The player must immediately jump on the first ? Block and then again to get the first Purple Coin. After a few more ? Blocks, the player must jump on a trampoline, hit a Red Ring, and collect all five Red Coins to get a Super Star. The player must then bounce to get the second Purple Coin, enclosed in some Hard Blocks. Immediately after, the player must wall jump between two warp pipes and carefully slide down the top portion to get the third Purple Coin. Then the player will reach a line-controlled platform to take them up to the next slide. The player must then jump down into an alcove to get the fourth Purple Coin. After wall jumping up, the player will cross some Goombas before entering a cannon. They must shoot straight up to get the fifth and final Purple Coin. After another trampoline and just a few more slides, the player will reach the Goal Pole. The level starts out with a slope with many Goombas. The player must immediately jump on the first Hard Block, then keep jumping after each Hard Block until they reach a ? Block, in which they must jump again to get the first Black Coin. After jumping on a trampoline and wall jumping, the player must hit a Red Ring and collect all five Red Coins to get a Super Star. The player must bounce and wall jump to the left to get the second Black Coin, on top of some spikes. The player must then take the lower path and use the next trampoline to bounce through the Brick Block enclosure to get the third Black Coin. Then the player will reach a line-controlled platform to take them up to the next slide. The player must then wall jump off the next pit, jump off the back arrow blocks, and wall jump off of a Hard Block to collect the fourth Black Coin. The player will then cross some Goombas before entering a cannon. They must shoot straight up to get the fifth and final Black Coin. After another trampoline and just a few more slides, the player will reach the Goal Pole. This page was last edited on October 7, 2018, at 14:52.